Inflatable kayaks are nice to have in an emergency or when you’re on a budget, but the Salty Dog has learned that it is easy to get wet in them. If you want to have a safe experience, instead of a deflating one on a full day of water recreation, then these inflatable kayak reviews of my all-time favorite designs will help you stay dry, have a good time, and save you some cash in the process. Some inflatable kayaks will leave you with a deflated wallet and little to show for your purchase. Here is the chart of my favorite inflatable kayaks so that you won’t get stuck with a lemon. What Is An Inflatable Kayak and Why Do You Need One? For a long time, the inflatable kayak was nothing but a bathtub toy. You could take it out on the lake with a beverage on a sunny afternoon, but that was about it. The modern inflatable kayak, however, has evolved over the last decade to become a pretty serious machine. Some are designed to withstand white-water rafting, so you can definitely take one out on your local lake without trouble. Fishing from them is even possible as long as you watch your gear. The need for one always involves price. A molded kayak is always going to be better than an inflatable one, there’s no getting around that fact, but you can’t typically get a molded kayak for less than $250 or fold a molded kayak down so that it fits into the trunk of a car. If you want to play on the water and you can’t haul a boat, this is your best option. The #1 issue that you need to look at when considering an inflatable kayak is how well it is able to track. They go faster and straighter than the inflatable boats of the past, but there are still a few challenges that may need to be overcome. Look for one that has the righter material in the frame so that your needs can be effectively met. What Makes a Good Inflatable Kayak? You’ve got three basic options when it comes to the best inflatable kayak’s outer shell. PVC. That’s right, folks. One of the best materials is the same stuff that is underneath the kitchen sink. If it’s good enough to hold the hot oil that you pour down the drain because you’re too lazy to dump it the right way, then it’s good enough to hold you on top of the water safely. Fabric-Skin. These boats have a more natural water resistance to them because of the design of the frame. You won’t be as worried if you set something down on these boats because it can resist damage pretty effectively. Hypalon. This material is a synthetic rubber that is very lightweight, able to resist chemicals and extreme temperatures, and it even absorbs ultraviolet light if you care about that sort of thing. Look for high grader hypalon to have the best experience overall and try to get something thicker than 1/16 inch if you can. This material also tends to be the most durable. Why is the skin you choose important? The right skins will either allow you to have a long-term investment with the best inflatable kayak or it will cause you to waste a couple hundred dollars (or more) and leave you muttering under your breath. White-water requires a different material than floating on a lake. Choose your needs and then you’ll pay a fair price. Some inflatable kayaks also come with a reinforced hull, usually aluminum because it’s lightweight, yet will still fold down to fit into the trunk of a car. These are better options for those who have active water in their sights or want to do a little fishing from their craft. 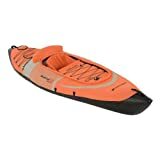 What Are the Inflatable Kayak Basics? Outside of the price, the things to consider with an inflatable kayak are the weight, the length, and the material. You can find tandem inflatable kayaks, but here’s a Salty Dog fact: we call those “divorce boats.” Why do we call them that? Because, inevitably one person screws up and dumps both people in the water. Singles are usually a better option. Most inflatable kayaks are going to be 14 feet long or less. If they are longer than that, then the boat can destabilize and that’s not a good thing. Even the best inflatable kayak is going to be more prone than a regular boat to flipping over, so keep length in mind. Weight is also an issue, especially if you plan on hiking your kayak into the backcountry. Some weigh as little as 17 pounds, but the average weight of a fully deflated kayak is usually above 30 pounds. If you’re concerned about punctures, then you’re going to need a thicker skin, which means you’ll need a heavier boat. What Are the Prices of the Best Inflatable Kayaks? Here’s the best news about inflatable kayaks: they are extremely budget friendly. You’ll find entry-level kayaks of a good quality on Amazon right now for less than $200. Even the top of the line models won’t really break your bank account. There are a few that top out around the $2,000 mark, but those are top quality, reinforced hull boats. The average person is going to find a really good inflatable kayak for around the $600 mark right now – and you won’t have to get any gear to haul it since you can just toss it in your vehicle. With a motor mount fittings and oar holders that actually hold your paddles well, you’ll find that inflating this kayak is a pretty easy task. It fills up quickly and compresses tightly in just minutes. 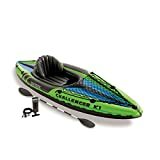 It’s a strong enough kayak to be able to take out onto the water for some fishing, and it has the ability to stand up to some white-water action as well as long as it doesn’t include a bunch of rocks. If your goal is to head out onto the lake for a relaxing afternoon, this inflatable kayak could be the best one available right now. Buoyancy can be a major problem when it comes to inflatable kayaks. That’s why the best inflatable kayaks have multiple air chambers for support. You’ll find three separate air chambers are available on this craft and there are Boston valves on the two main hold chambers that help to manage the airflow quickly and efficiently. There’s also an inflatable I-beam floor that add some extra rigidity to this craft, which is nice. The oar locks are also included with the frame and are on each side of this tandem kayak. If you need to take your friends out on the water and you are not willing to pay a high price, do it, then this inflatable kayak can help you get the job done efficiently. It’s able to hold up to 880 pounds and includes a gear pouch, pump, and even cushions so that you can be comfortable while enjoying a day out on the water. There are even two fishing rod holders included so that you can enjoy some time casting and a rocking guard will help make sure that you stay on top of the water instead of being dunked in it. If you just want to have a nice time on the water by yourself, then you don’t need to invest in a massive inflatable craft. The best inflatable kayak for you would be one designed like this. The 1000D polyester bottom isn’t m favorite design and you’re limited to a 250-pound capacity, but at 10 feet long and with plenty of room inside of it, you’ll be able to enjoy some water recreation on a warm day without much problem. Multiple D-rings are included and bungee lacing will help you bring along some extra supplies. If you have trouble tracking a kayak, want one that’s big enough for two people, and want the chance to get out onto the water in just 8 minutes, then this inflatable kayak is going to meet your needs. I particularly like the self-bailing drain valve because this gives some extra security to its users while out on the water. The inflatable spray skirts that lash down to the craft are also a nice little added touch to the design of this kayak. This is one of my favorite inflatable kayaks because it really has a sporty feel to it. The cockpit is secure, yet still comfortable, and the streamlined design lets the kayak go over some slow-moving rivers with ease. The cargo net is large and right in front of the cockpit so items can be easily accessed. It weighs just 27 pounds, but has a weight capacity of 220 pounds, so not everyone is going to benefit from this craft. 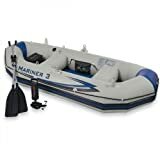 For those that can, however, this boat looks good, operates well, and can be found on Amazon for less than $100 at times. You can’t beat that! This might be the best inflatable kayak for fishing. It’s still got enough storage space for you to go fishing, but it folds down nicely for easy transportation and shipping. The sides of the inflatable hull are reinforced with aluminum plating so that you’ll still have some strength out on the water. This isn’t going to be the right kayak for a high wave environment, but for a still day out on the lake? Perfect. The bungee cording in front of the cockpit is a nice added touch. With a 500-pound weight capacity, this puncture-resistant inflatable kayak is made from strong materials that really feel like they’ve been reinforced. It’s strong enough to handle Class III white-water and the seats inflate with the boat. It ships with a foot pump, but you’ll be there all day trying to stomp the air into this craft – bring something powered with you if you can. There are 9-inch tubes and an air reinforced beam down the middle for added stability. It’s enough good stuff that even this Salty Dog would look to purchase this tandem kayak. Intel calls this inflatable kayak a 4-person boat, but it’s really more of a 2-3 seater. That’s because the inflatable seats are more like a bench, so two people are going to have to get real cozy in order to make the design work for four people. On the bright side, you’ll have a couple of fishing rod holders available to you so that you can make the best of your cozy situation. Motor mount fittings are also attached and the bottom of the boat has been reinforced with an extra air chamber. For the price, there’s a lot of good stuff going on with this inflatable kayak. The low profile of this inflatable kayak makes it a good one and the bright yellow color makes it pretty easy to spot. The inflatable seats in this tandem craft are actually adjustable, letting users be able to find a comfortable spot. There’s a removable skeg for directional stability and you can remove the seats if you don’t want them in there with the included Velcro straps. If you decide to use this as a solo kayak, make sure that you put a little weight in the front so that it gets balanced correctly. What is the best inflatable kayak for you? Take this information along with you as you shop for a great little craft to enhance your water recreation and enjoy this Salty Dog guarantee: inflatable kayaks prove that it doesn’t need to cost a lot to enjoy the water on a hot day.